April 4, 2011. 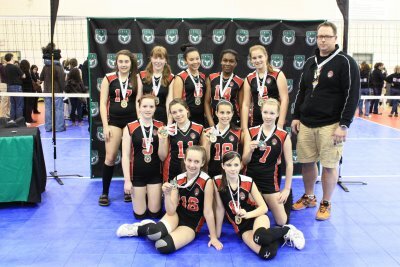 DA Girls 14U Red Win Gold (Div 2/Tier 3) at Provincials in Kitchener on April 3, 2011!!!! Congratulations Team! You worked hard and it paid off – Great Job!!! 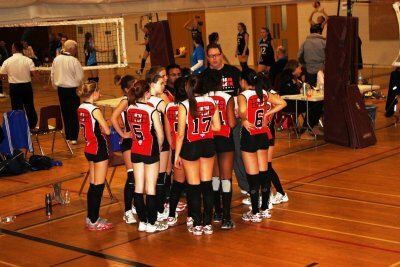 Our journey started on Friday night with a loss in a 3 set match with the Kitchener Predators. 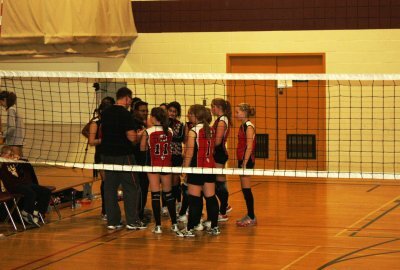 The girls managed to turn things around with a win in the 2nd match against the Waterloo Tigers. Our final set of the night proved to be a big challenge with a 2 game loss to the Etobicoke 381 Team. Although Saturday started off on a low note against Storm Tsunami losing 2 games back to back, the girls managed to quickly turn it around and win their next two matches in 6 games against Vista & Barrie Elites. 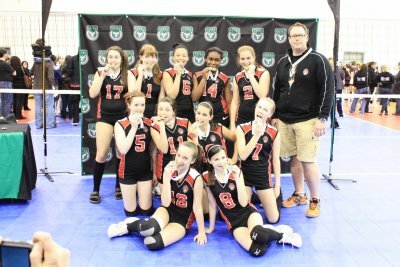 Taking us into Sunday, the girls worked their way through 3 matches, a total of 9 games, beating out the KW Predators, Pegasus Nitro & Peterborough Thunder to get themselves into the final GOLD/SILVER match against DRVC 13U. 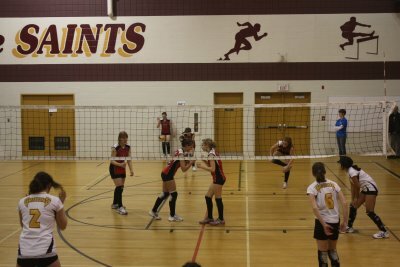 Losing the 1st game of the 3 set match, the girls fought back hard & dug deep to win the next 2 games. What an exciting time for the team, coaches & parents too! The weekend was a lot of fun and very exciting, a first for many of the team members & us parents too!! The tournament was really well run and overall was just a fantastic experience. 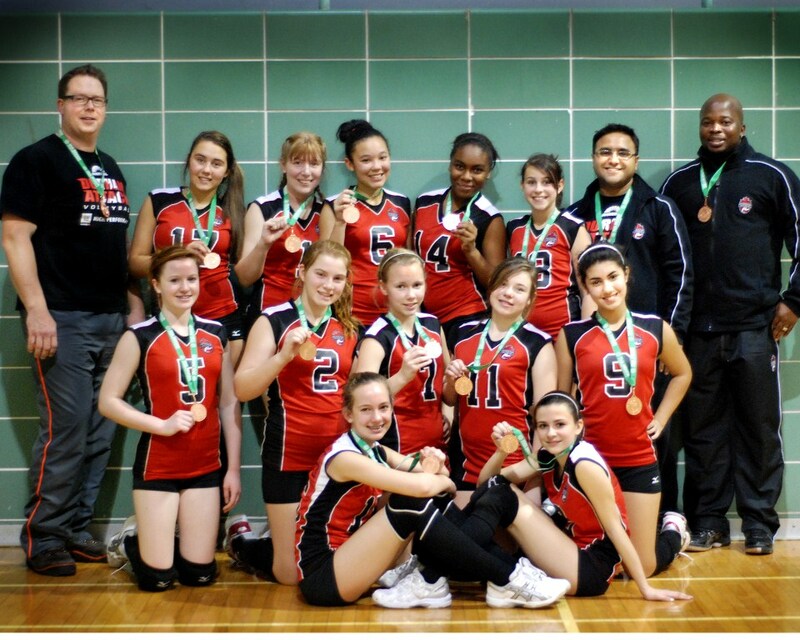 We witnessed a lot of great volleyball moments and look forward to more at the Nationals in Sherbrooke this year. Saturday was another day of exciting tournament play for the girls, coaches & parents. The team played a total of 5 matches, 3 in pool play & 2 in crossovers. The girls continue to grow as a team. A showcase of skills & ability was quite evident in an awesome match 3 played against the Maverick Six-Shooters. You had us parents on the edge of our seats!! It was very fun & exciting to watch. March 5th, in Peterborough again for 15U Bugarski Cup – BEST OF LUCK TO YOU ALL!! Happy March Break Everyone – Enjoy & get rested up for the Provincials on April 1st!! DA Girls 14U Win Bronze at McGregor Cup in Kingston! February 20, 2011 – DA Girls 14U Win Bronze at McGregor Cup in Kingston on January 8, 2011 for Zone E.
Congratulations Team to a job well done. This is great for a new team and our 2nd tournament of the season. The team has improved immensely since the start of the season. Let’s keep the momentum going! Looking forward with great anticipation to the 14U Bugarski Cup in Peterborough on February 26th and again on March 5th, when we step up to the 15U group!! 1) Practice Monday February 28th moved to Terry Fox in Ajax & new time from 8:15 PM – 10:15 PM.